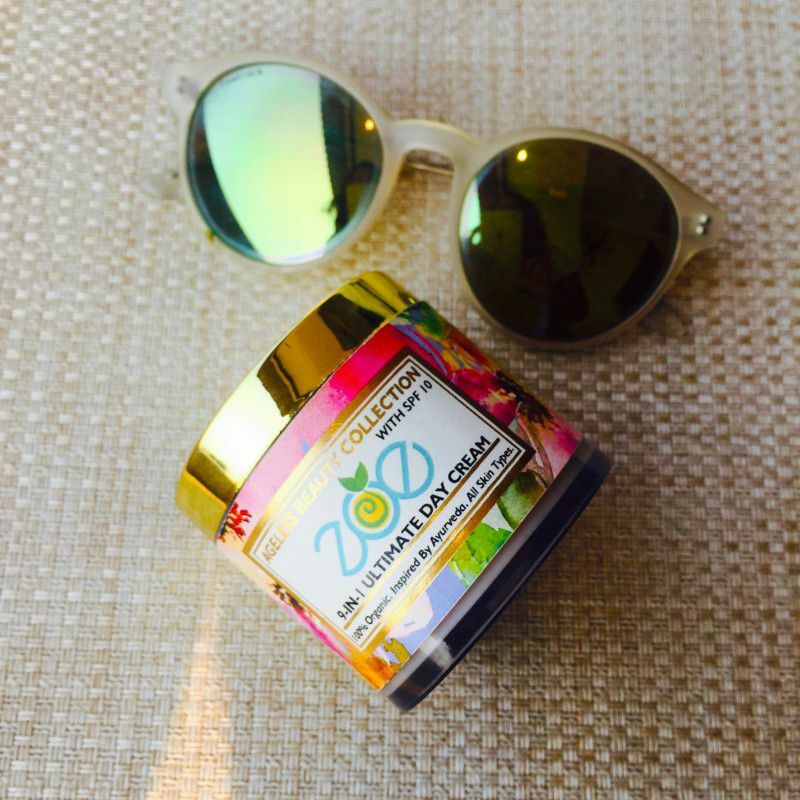 Our 9-in-1 Ultimate Day Cream is 100% Certified Organic, 100% Natural, 100% Vegan and 100% Pure. It is Cruelty Free, Paraben Free, GMO Free, Chemical Free and Toxin Free. Your skin will get deeply moisturised, whether your skin is dry or oily. Our cream is inspired by Ayurveda, and it combines anti-ageing beauty secrets with ancient wisdom and modern know-how. Acai berries are native to the Amazon rainforests of South America. They are rich in anti-oxidants, fats, vitamins and minerals, making them the healthiest berries in the world. Acai berries control skin pigmentation, they control acne, lighten the scars, hydrate the skin, make our lips soft. They are also very good for hair growth and promote a healthy scalp. Vitamin E is both a nutrient as well as an anti-oxidant. It nourishes the skin, treats stretch marks, lightens scars, acts as a moisturiser, treats sun burn and chapped lips. It is a must have ingredient in all our beauty regimes. Vitamin C has abundant quantity of anti0oxidants and collagen, making it a vital molecule for skin health. If you want to look like you're in your 20's, when you're in your 40's, start applying Vitamin C to your skin everyday. Vitamin C keeps the skin supple and wrinkle-free, reduces under-eye circles, protects skin form the harmful effects of UV rays, reduces skin discolouration, improves hydration and moisture, reduces inflammation and speeds up healing of sunburn. Lavendar essential oil is distilled from the steam of delicate purple lavendar flowers. Lavendar oil is potent and gentle at the same time. It has a soothing effect which helps to cleanse and detox the skin from within. Lavender essential oil helps in treating acne as it is anti-inflammatory. It helps to prevent skin discolouration. It can treat eczema and psoriasis, sunburn as well as skin fungus. Lavender essential oil is also an excellent, all natural insect repellant. Neroli oil is an essential oil produced from the blossom of the bitter orange tree. Its scent is sweet, honeyed and somewhat metallic with green and spicy facets. Neroli Essential Oil makes the skin smooth, free from infections, and adds a glamorous glow to it. It also helps maintain the right moisture and oil balance in the skin. It also makes our skin look younger. Apricot kernel oil is rich in Vitamin K, which is known to reduce dark circles. It also contains Vitamin E and omega 6 fatty acids, that together with Vitamin K nourishes the skin deeply, allowing nutrients to penetrate the surface of our skin and reach the blood cells. Jojoba oil is native to America. It is a liquid wax extracted from the nut of an indigenous American shrub, and is the closest to the oil produced by the human skin called 'sebum'. This oil contains essential vitamins like Vitamin B and E and key minerals like zinc and copper. As we age, our skin produces less sebum, making the skin look dry and dull. Jojoba is a natural supplement that can you used as a regular skin care routine. Jojoba oil hydrates the skin, makes lips softer, reduces wrinkles, treats skin burns, and is a great make-up remover. Natural aloe vera gel contains two hormones - Auxin and Gibberellins. These two hormones provide wound healing and anti-inflammatory properties that reduce skin inflammation. Regular use of aloe vera also helps in treating skin problems like psoriasis, eczema and acne. Zinc Oxide is being used by humans since the last 5000 years to protect the skin from sunburn, to treat acne and to heal wounds. It is the most natural and gentle sun-screen protection available in the market today. 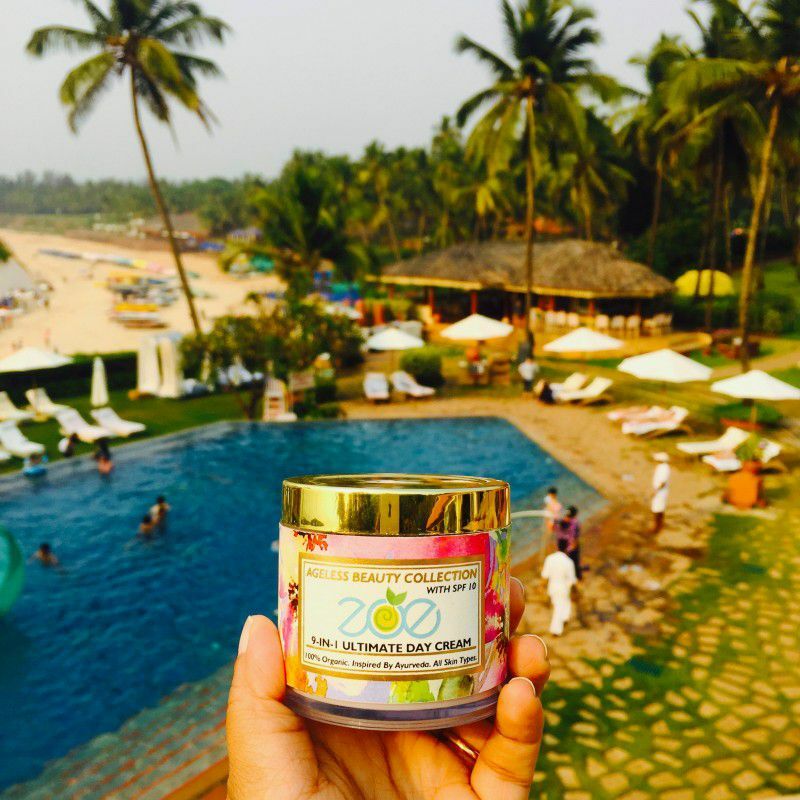 Presently, only the world's best and top brands use zinc oxide as a sunscreen, and Team Zoe is proud that we are one of the few Indian brands that have introduced an SPF lotion with zinc oxide. While zinc itself can be found in nature, zinc oxide is made by chemically heating the zinc with oxygen molecules. Pure zinc oxide is a white crystal powder that sits on top of the skin and forms a protective layer. Zinc oxide is so pure and safe that it can also be used on infants to protect them from harmful UV rays as well as to prevent diaper rashes in them. Capric Tri Clyceride is derived from coconut oil and glycerin. It is the best natural emollient (skin softener) and skin-replenishing ingredient. It is considered a superior emollient for face scrubs because it is very gentle and soothing. Cetearyl alcohol is a fatty alcohol which is used as an emollient, texture enhancer (emulsifier) and foam stabilizer. The cetearyl alcohol used in our products are 100% natural, and derived from plants. Products which contain cetearyl alcohol are allowed to carry the label of "alcohol free" as it is 100% safe and does not pose the risk of sensitising the skin. Glycerol Mono-stearate acts as a lubricant on the skin's surface, which gives the skin a soft and smooth appearance. It also slows down the loss of water from the skin by forming a barrier on the skin's surface. Aqua is essentially de-ionised or distilled water, and is a common form of water used as a base for natural skincare products. Aqua is 1000 times more solution that tap water, which makes it a more desirable base for good quality skincare products. Vegetable glycerin is a 100% plant-based humectant, which helps to preserve the moisture in our skin's top layer, so that moisture reached till the deepest layer of the skin. Since it it plant based, it is good for even sensitive skin. Xanthan gum is a 100% natural polysaccharide - a sugar-based polymer produced by bacteria. It is used as a viscosity agent in creams. La'Phen DB is a mild liquid preservative that is 100% natural, and does not contain any harmful chemicals like formaldehyde, halo-organic components or paraben. Only 0.2% - 0.5% of the entire product composition contains this preservative. Use every morning. In case you have dry skin, apply once or twice during the day as well. Cleanse your skin with our 'INSTANT BRIGHTENING FACIAL SCRUB'. Apply a small amount on your face and neck with upward strokes till the cream is completely absorbed. 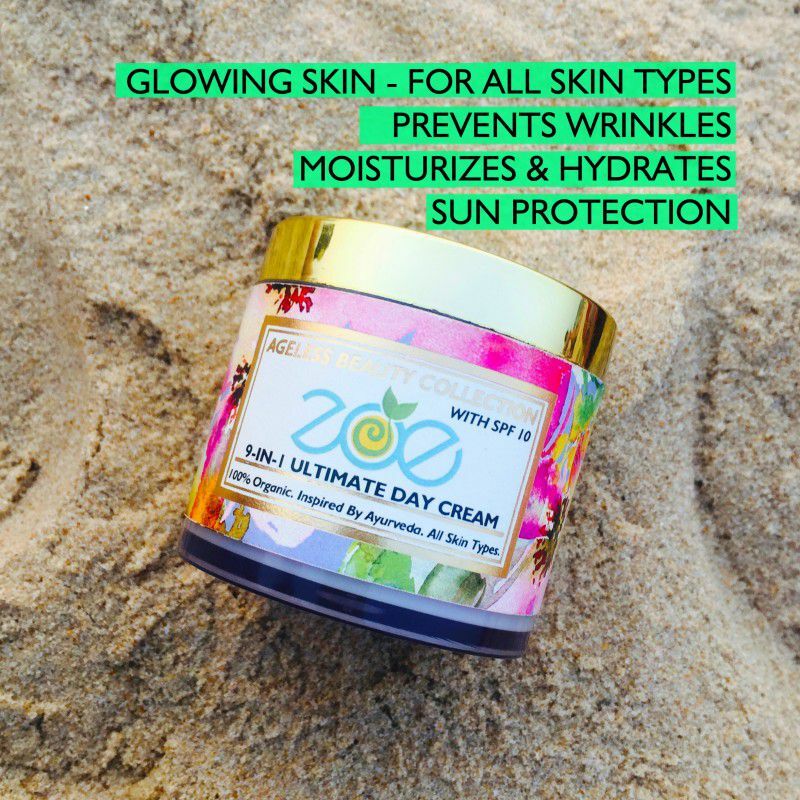 The 9-in-1 Ultimate Day Cream has the goodness of 9 essential oils, flowers, herbs and other exotic ingredients sourced from 100% certified organic sources. When you apply this magical potion, it goes deep into your skin, and nourishes every vital cell within your skin, to give you a radiant glow. Each jar contains 100 grams of goodness.